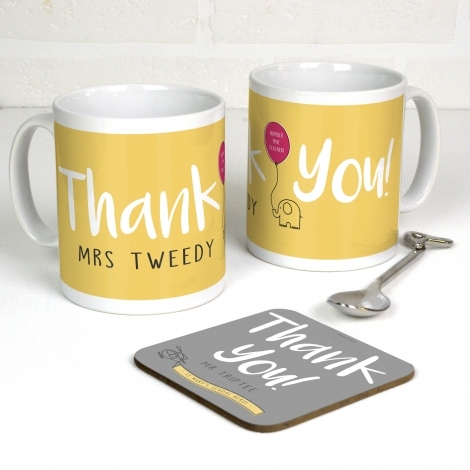 A fab thank you gift - this personalised mug features cute icons with space to put your individual message and name of your recipient. This thank you gift mug makes a perfect gift for teachers, pet sitters, neighbours that water your plants whilst you are away - basically anyone you'd like to say thanks to! In contemporary colours and cute graphics, they will be a smart addition to the home or staffroom. Choose from the Elephant with Balloon design or Helicopter with the banner and whichever background colour you would like. This product is almost infinitely customisable so if you have your own design or want to discuss your personalisation please contact us. After saving your customised product, remember to add it to your cart.